From a suggestion of my friend,池末 隆（Ryu Ikesue）,I started to study this seal. This seal was designed originally by J.S.Bach. On the upper part of the crown,there are seven circle and five ovals. In the book of Herbert Anton Kellner,1980,he advocated that this design signifies the tuning system. 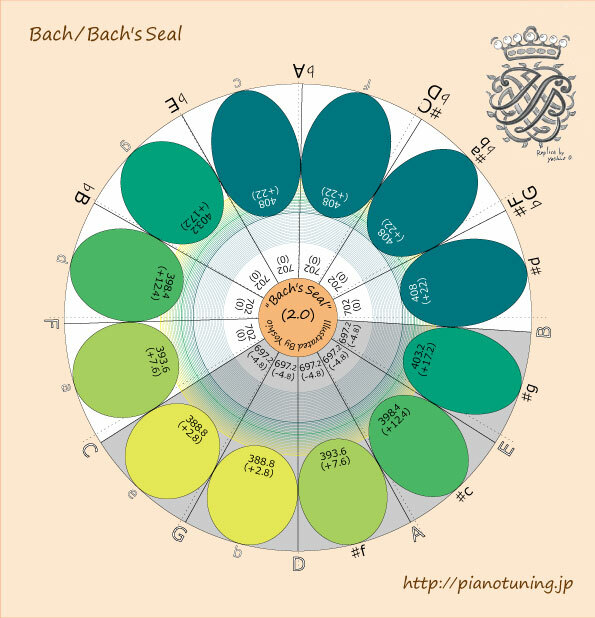 The upper circles are pure 5th and lower ovals are slightly narrow 5th. Kellner’s system sets one of the narrow 5th in B-F# . This is effective to lessen the wide 3rd of Pythagorean scale. This graph shows my investigation of this seal. From the organ tuning system through the studies of Emile Jobin “well-tempered clavier”. I set the narrow 5th in succession. The total of seven pure 5th in [702 cents *7=4914 cents]. Remainder allotted to narrow 5th in [(8400-4914)/5=697.2 cents]. Succession of this five narrow 5th,C-G,G-D,D-A,A-C,E-B,make a pure 3rd in C-e and G-b. This constructs an effect of strict symbolic sound of church,almost as mean tone system. Key of F♯major and D♭major makes a perfect Pythagorean scale,pitch of wide 3rd that fits the melody,and the harmony has it’s own identity. Every key set up in gradation has its own character. This is a very favourable system. Under this design of the crown,there is the initial of J.S.Bach. This is very interesting. This is my copy of this seal. I drew this so that initial outstand. The pearls are colored with the color of Soukanzu. Reference:Tuning system from Pipe organ to Modern piano.